Long time readers (like, since August), might remember the successful Challah making that took place at New Fat Ladies headquarters (there was dancing, and celebrating). I am only one person and could not quite manage to eat a whole loaf of delicious challah in one go, so I sliced up a few very serious sized slices and sealed them in zip lock bags and tossed them in the freezer ready for a future brunch adventure. 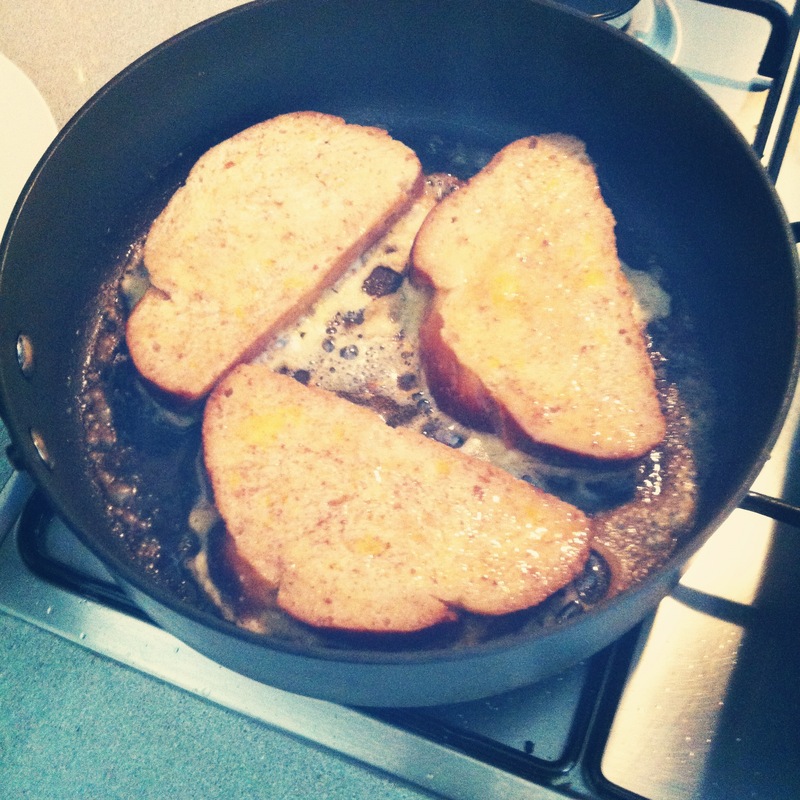 That adventure turned out to be brown sugar-y french toast! Note: If your bread is frozen, leave it out to thaw overnight so it’s ready for the morning. If using fresh, slice and leave it out overnight so it gets slightly stale. 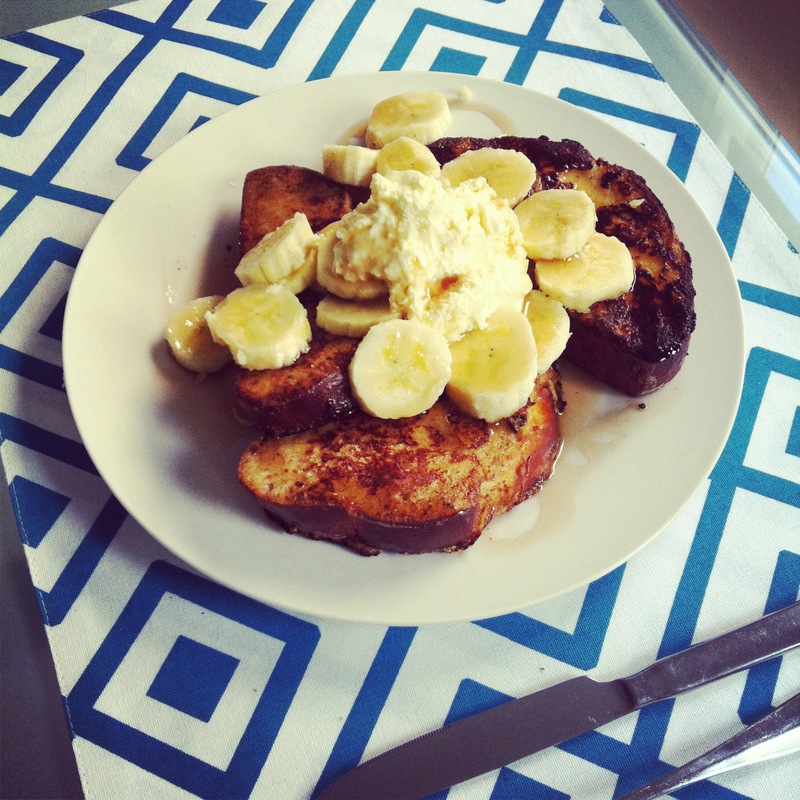 French toast is always better when made with slightly stale bread. In a dish that will comfortably fit half of your bread, use a fork to whisk together the eggs, milk, cream, brown sugar, cinnamon, ginger and salt. Lay 3 slices in the eggy mixture and leave for 3 – 5 minutes. Carefully turn slices over and soak the other side. In a large frying pan, gently melt a knob of butter (enough to coat the bottom of the pan) until it bubbles a little. Drain the excess eggy mixture off and add the slices to pan. Fry over a medium/low heat until it is deep gold and caramelises a little, turn and do the same with the other side. Remove cooked bread to a plate to keep warm in the oven. Repeat with the other slices of bread. Timing tip: When you remove the first batch of bread, add the remaining slices to the eggy mixture, turn those when you turn the ones frying. Pile the bread up on a plate, cover with banana slices, a dollop of whipped cream and drizzle maple syrup all over the pile. Share with someone else if you like, or shovel it into your mouth until you explode. Your call. I think you know which decision I made. Sometimes it’s fun to pretend I’m still in my vegetarian phase – I look back on that short period and laugh at myself, it was NEVER going to be sustainable for me to have a diet consisting of things that aren’t ever going to be bacon. This recipe (and many variations of it) appeared in that time and keeps appearing even though I am solidly an omnivore once more. It all came about recently when we conveniently arrived at S-J’s house just at the right time to see the magical Thornbury produce ute making it’s way down her street. Much excited exclaiming occured, and we tried to think of something delicious to be made for dinner from it’s contents, we came up with potato pancakes and taking inspiration from various web recipes we made a dinner fit for queens. Potatoes are delicious. It’s an actual fact. I feel it’s pretty safe to say that the potato is the most universally loved vegetable. Fried up into pancakes, as they are in this recipe, with a delicious crunch and soft starchy interior, brings a simple ingredient to an almost heavenly place. 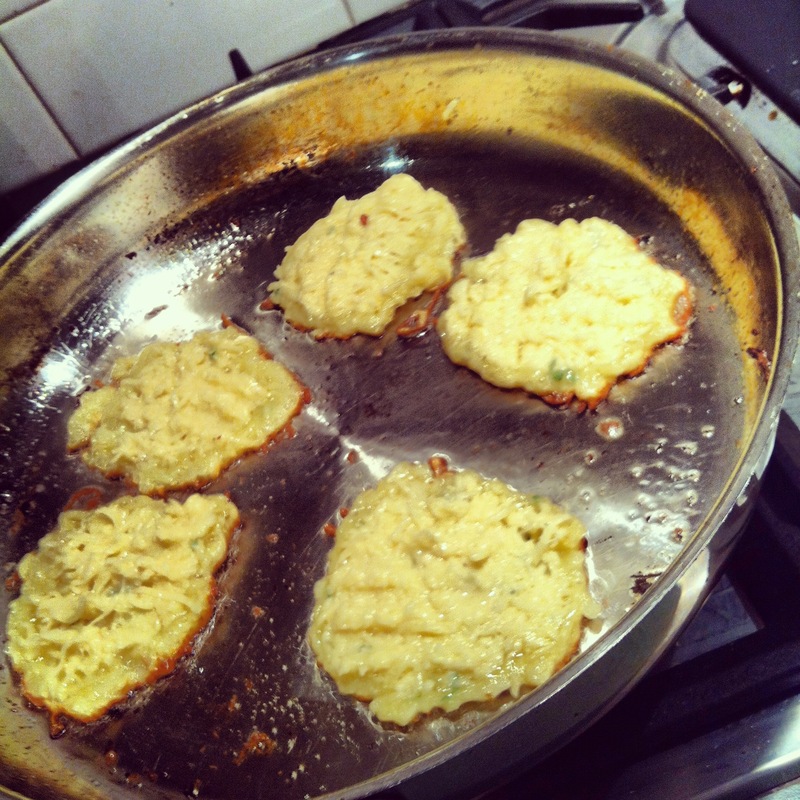 So grab your grater, a frying pan and all the condiments you can think of and make yourself a batch of potato pancakes! They are excellent for a light supper (if you make big ones like we did), or as a canape base if you make smaller ones, or as part of any decent brunch and any size! Preheat oven to around 150C, you’ll be keeping the fried pancakes warm as you finish frying the whole batch. Note: you will need either a bit of cheesecloth/muslin, or a spare not-too-thick tea towel. A food processor also makes this recipe much easier. Fit your food processor with the larger grater blade (or using your hand grater, prepare for a bit of work). Grate all the potatoes and onion together. In a large bowl, spread out the tea towel with the excess fabric hanging over the bowl. Remove blade and bits from the food processor, and pour/spoon the contents into the fabric. Once the potato and onion mixture is all in the fabric, gather up the sides and begin to wring the liquid out. Do this until no more liquid runs out into the bowl. Discard the liquid and leave the mixture, as is, for about 2 – 5 minutes. Wring out again. Discard liquid. In the bowl that was catching the liquid from the onions and potatoes, stir together the eggs, flour, sage, salt and pepper. It’ll be quite thick, resist the urge to loosen it up with any more liquid. Add the well-wrung and hopefully no longer dripping onion and potato mixture to the batter. Using your hands (or S-J’s hands because I am sneaky and really don’t like getting messy) mix together really well for a few minutes. The last bit of moisture left in the potatoes will help to loosen up the batter and it will become a delightfully sticky mixture. If you have a heavy based frying pan or cast iron skillet, use it now, if not, any large frying pan will be fine! Pour in enough vegetable oil as to coat the bottom of your pan. On a medium heat let it get nice and hot. Form your latkes into even sized blobs ready to drop into the oil, as you put then in the pan, flatten them out to the size that you are happy with (cook larger ones longer, canape size ones for less time. Also, if making latkes thicker than 1/2 cm, you will need to lower the heat slightly and cook them for longer). Fry for 2 – 2 1/2 minutes or until a deep golden brown, flipping over gently and frying for a further 2 minutes on the other side. Remove cooked latkes to a plate covered in paper towel to drain off the oil. Keep plate and cooked latkes in a warm oven, repeating the paper towel and latke layers as they cook. 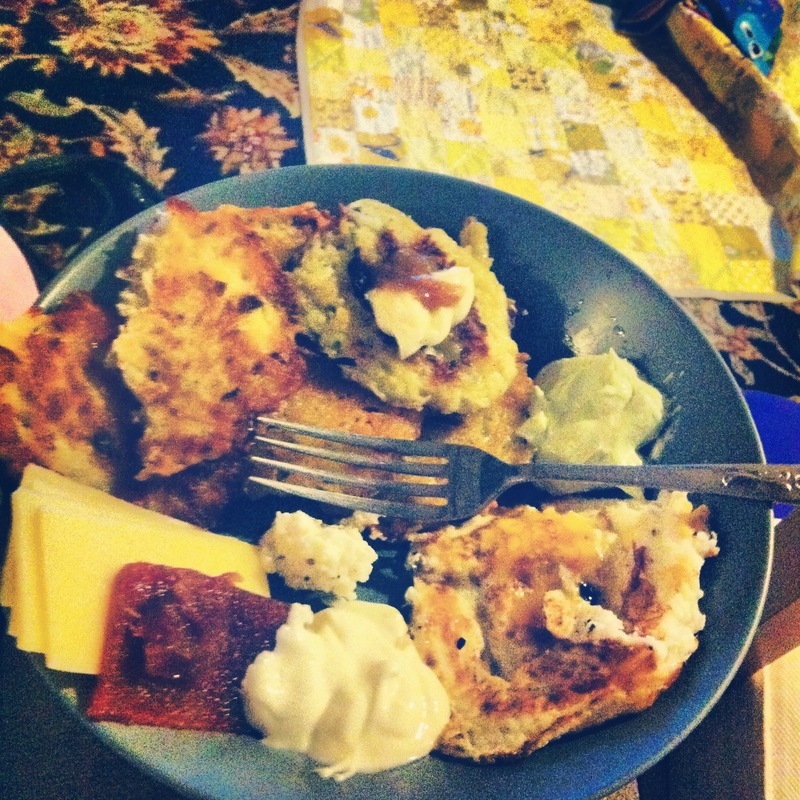 Once all the latkes have been fried, serve with your chosen toppings, and crunch away! p.s. Q) How do you know if it’s a Katie-post? A) The photos are terrible! Sorry readers! S-J and I are both a little bit silly, and decided that after work on a Wednesday night is the PERFECT time to try out a multi-step, dough based, multiple rising recipe. Honestly, what could go wrong with that logic? But, it was an excellent idea after all! 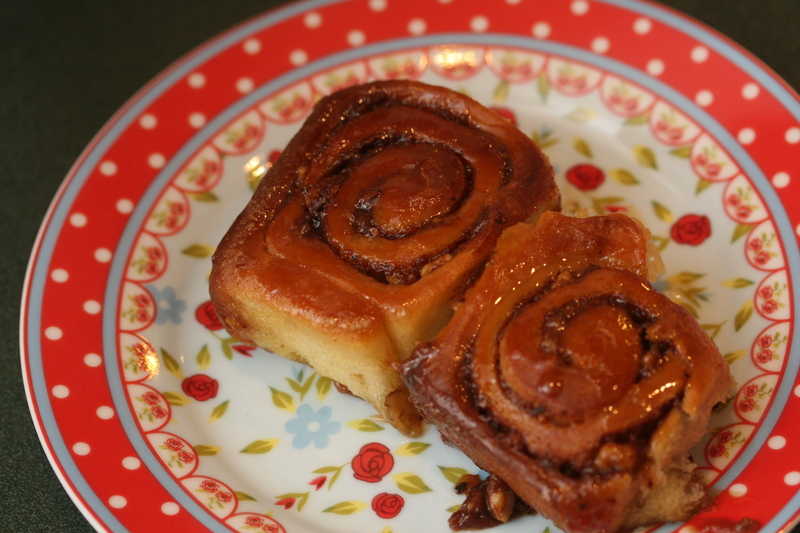 These delicious little scrolls are, if possible, actually more delicious the next day so I would encourage you to try this as a make-ahead for a breakfast or morning tea. In the bowl of your stand mixer (if you have one, or a large bowl if not) gently combine the separate 1 tbsp caster sugar, yeast and lukewarm milk. Sit the bowl in a warm place for 5 minutes or so to activate (when it starts to bubble, you’re good to go!). Whisk eggs lightly with a fork, then whisk into yeast mixture until smooth. Fit the dough hook onto your mixer. In the same bowl, combine yeast mixture with the remaining sugar, flour and 1 tsp salt. Stick the bowl back on the mixer. Mix on low speed until a very soft, sticky dough forms. With the mixer running, add 125g chopped butter, one cube at a time, ensuring each piece is mixed through before adding the next. I needed to do a lot of stopping and scraping down the hook and bowl through this process. 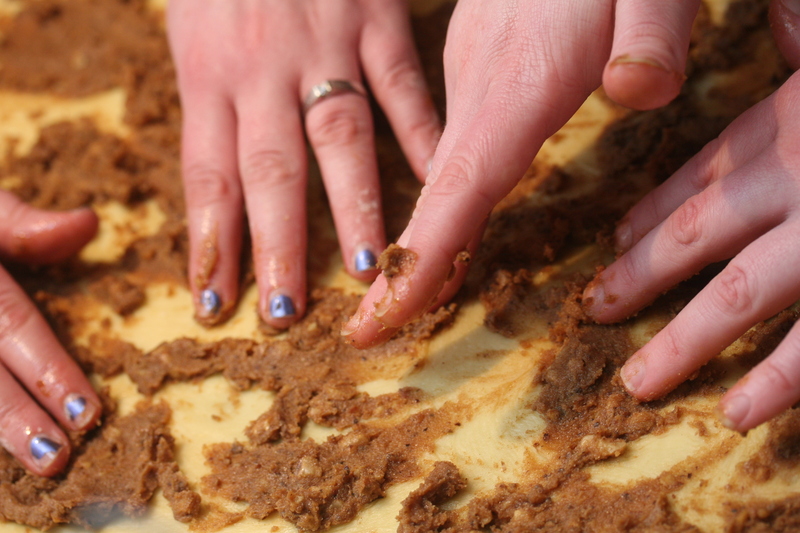 Knead, using the mixer, on medium–high speed for 8 minutes (or your super strong arms), until dough is soft and silky. It is a VERY sticky dough to start off, I think I checked with S-J approximately 11 times whether or not we had added all the flour yet, but, it does all comes together after all that kneading and gets pretty sturdy. Place dough in a lightly greased bowl. Melt remaining 10g butter and brush over the top of dough (or if you can’t find the brush because you’re in someone else’s kitchen like I was, rub the butter on with your fingers and then attack the cat with butter fingers). Cover with plastic wrap and set aside in a warm place for 1½ hours or until the ball of dough doubles in size. Heat up a medium fry pan on over a low heat, add chopped walnuts, and shaking the pan fairly constantly, toast on all sides. Remove from heat and set aside. To make caramel, stir butter, brown sugar, cream, maple syrup, vanilla and 1 tsp salt in a small saucepan over high heat until combined. Reduce heat to low and simmer for 5 – 10 mins, or until reduced and shiny. Pour two-thirds of the luscious sauce into your baking dish, tilting to coat bottom and sides, then sprinkle half of the toasted walnuts. Leave the left over sauce in a warm place until the scrolls are baked (if it cools too much, reheat very gently over a low heat, just until runny enough to pour). Remaining walnuts are for the filling. Clean the dough bowl and replace it in your mixer, with the whisk attachment fitted. Beat butter, sugar, cinnamon, nutmeg and ½ tsp salt for 2 minutes or until light and fluffy. Stir through the remaining walnuts. Punch down your gloriously risen dough! Turn out onto a lightly floured bench. Using a rolling pin dusted with flour, roll out to a 1/3 cm-thick rectangle, or using gentle stretches, pull it into a thin dough sheet over the floured surface. Spoon small amounts of the filling over the dough and using your nice warm fingers, begin spreading the filling evenly over dough, leaving a 1 cm border (Note: HA! Evenly! A filling with sharp and nubbly bits of nuts pushed over a thin and delicate dough? NOT SO EVEN.). Place a slightly damp tea towel over the pan and place in a lukewarm oven (like one you made dinner in, then turned off and remembered about 20 minutes later) to rise for 15 minutes. Remove from the oven while it preheats. Preheat oven to 180°C. 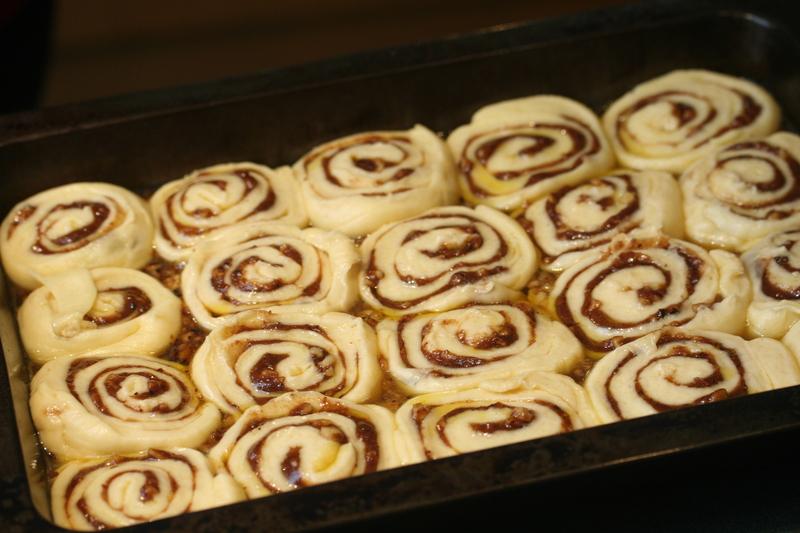 Bake for 20 – 25 minutes or until buns are golden brown and the filling is bubbling. If the buns are browning too quickly, cover with foil. Cool for 5 minutes, then spoon over the leftover caramel sauce that is hopefully still warm. Eat! These are excellent the next day as well. I imagine they would freeze quite well at either fully baked stage, or before the final rising – if freezing before rising, allow to defrost at room temperature and then bake, once risen, for 30 minutes.